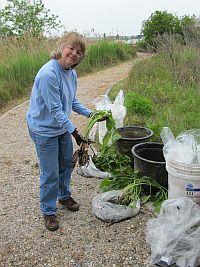 Karen Duhring, a VIMS-CCRM wetlands scientist, has been awarded a fund for two Floating Treatment Wetlands, which are engineered products designed to grow wetland plants and provide water quality treatment in storm water ponds. One floating wetland will be placed at the VIMS Teaching Marsh and the other in Lake Matoaka adjacent to the Keck Environmental Field Lab. VIMS graduate students involved with the Perfect GK-12 science education program will have the opportunity to incorporate the Floating Treatment Wetland into their existing Teaching Marsh science class programs. Students at the Keck Environmental Lab will be given similar opportunities to study the design and performance of the floating wetlands.